Today’s brief preamble to the tasting notes: Here’s the last of the Bruichladdich tasting pack. After setting itself apart as the lone Islay distillery to make unpeated whisky, Bruichladdich decided to show it can make ’em with peat, too. Named after the village that lies two miles from the distillery, Port Charlotte is Bruichladdich’s first (but not only) entry into the classic Islay whisky profile. Today’s tasting notes: It smells like sea wind blowing over a bog. It tastes like water drawn from said bog, first poured over a dead campfire. This is dirty, rough whisky, and I would not advise it for anyone not already into peaty Scotch whisky. Today’s thoughts: I rather enjoy the sea. Not as seen from a beach. Not with people about. Not in summer. Give me the rough, rocky Atlantic in winter, a sea into which I can stare and imagine the great squid god lying below, waiting to rise. Today’s wish list notation: As I mentioned, this is the third of three whisky varieties in a Bruichladdich tasting pack. The distillery makes a fourth, “super heavily peated” variety, named Octomore. As a fan of cephalopods and peaty whisky, I need a bottle. Today’s toast: To the sea, and every wonder within. Today’s tasting notes: This is a new one. At least, I don’t recall having tried it. It’s the product of another venerable whisky distillery, the northernmost in Scotland. There, on Orkney Island, they still malt their own barley before drying it over a fire fueled by peat with a heavy dose of heather. The marketing spiel says that heather gives the whisky a floral character. I can’t say I detect that by smell, but then I may be a touch stuffy at the moment. On the tongue, it is warm and smooth. It goes down easy, leaves a lingering pleasant warmth with maybe the faintest kiss, almost a memory, of smoke. Today’s thoughts: I grew up in the South. Rural southern Georgia, if specifics matter. There are things about Chrismas in the South that are different than Christmas elsewhere. We don’t expect snow, for starters. Sure, we dream of a white Christmas, but we know it’s just that — a dream. Actual white Christmases happen to other people. Northerners, mostly. My first Christmas in Maine was a bit of a revelation in that regard. Christmas there is like the Christmas I had only seen on greeting cards. Snowy landscape. Smoke curls from cute chimneys. And everywhere everyone was eager to stay indoors, playing cards and drinking something warm. Also, they have this weird substance called “stuffing” which is used in place of dressing* at the holiday meal. I can’t say I completely understand the reasoning, but it is enjoyable enough. 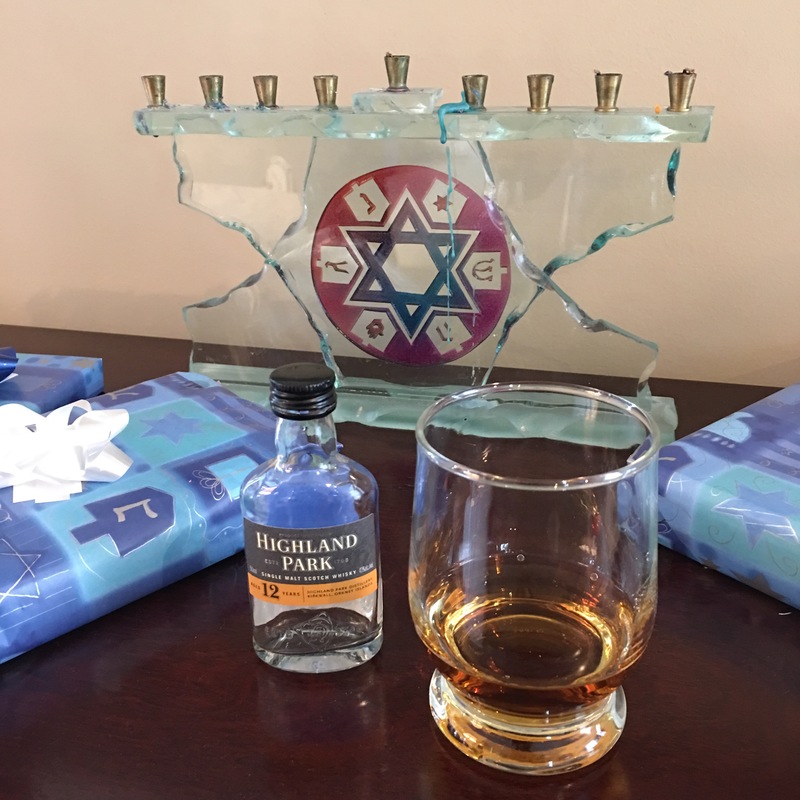 This is the third evening of Chanukah, and I have enjoyed the past two, so today shall I stand respectfully quiet as the family kindles their menorahh and my five-year-old nephew tries to keep up with the words of prayer and song that go along with the lighting of candles. 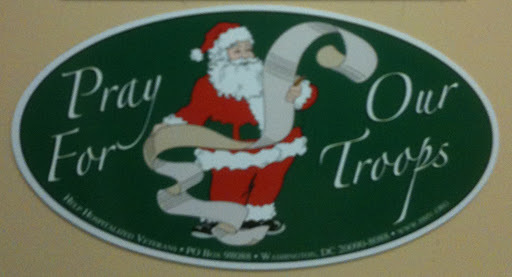 Today’s note on passive-agressive holiday greetings: There really is a lot to celebrate. Be gracious, wherever you find yourself . * — If you are not from the South, I will forgive you not knowing about dressing. I am not talking about the stuff that goes on salad. Think of southern dressing as a stuffing casserole and you will have close to the right image. I miss it and will very probably have to make my own before the year is out. ** — Is there a word for that relationship? A proper word, I mean? Some people would refer to the two of us as brothers-in-law, but that is both confusing and technically incorrect. As Ann Landers put it, “You are no relation; you are just two men who married sisters.” But we are family. We need a word. *** — I am not the drunk uncle. Mostly. I try to restrict my uncling influcence to hats, beards, and Star Wars. Sometimes I consult on train layouts or LEGO arrangements. Also, I make pancakes. Today would have been my maternal grandmother’s 89th birthday. My mom and my younger sister, who still live in our hometown, usually visit her grave, and, since the timing is right, use this as the occasion to put out the holiday poinsettias at the family plot. My sister plays Roy Orbison songs because he was my grandmother’s favorite. I’m never quite sure what to do with myself. I don’t live close enough to visit the cemetery, and I don’t have the same connection to the music as my sister. Usually I spend some time thinking of her, remembering, wondering, imagining the things I would talk to her about if I she were here, as though she’d just been away for a while. Today, I decided to go try a new Trappist beer. I don’t recall her ever drinking beer, and I don’t know what opinions she might have had about Trappist monks. She died well before I took an interest in either, so her take on these subjects shall remain a mystery to me, a couple more items on the long list of things I wonder about when I think of her and all the years she’s been gone. I imagine she’d tell me to enjoy myself, and probably chide me to behave and not overdo it, and I’d assure her that drinking Trappist beer is a religious experience, not an intoxicating one. And she’d get the joke, which would elicit that disapproving-yet-loving scowl of hers, and she’d tell me to come closer, which I would do despite knowing what was coming. What was coming would be a grandmotherly swat on the backside and her wagging a finger and telling me to be nice or the Devil would get me. And I would nod, and agree, and never tell her I’m agnostic. Then she would tell me I need to write more, and I would promise that I’m working on it, and I would mean it, because no one breaks promises to Nanny. So the end of the day would find me savoring the beer, blinking my watery eyes, and keeping the promise. Please quote me, chapter and verse of your holy book, where Jesus said a word pertaining to homosexuality. Maybe reread the entire New Testament. Might be good for you. This bumper sticker is either a brilliant bit of satire, on the “Santa as god of war” level, or, well, given what I know of the person who owns it, it’s just bloody stupid.